← Hot, Hotter, Hottest. The Coolest Clothes I Can Wear for Summer. SWIMS™. I know everybody and their mother’s uncle has blogged about them, but I can’t get ’em off my mind since I first ran across them at Mr. Porter, my favorite on-line shopping-tainment site. Completely waterproof (read: manmade materials), very stylish. Walk from the car to the pool, the pool to the bar and grill, out into the sudden summer downpour and back into the car, repeat as necessary. This has to be the perfect answer to the problem of the flip-flop. It comes in a penny, too. At USD$150, they’re not cheap, so you may want to stick to your classic Sperry Topsider in leather and get ’em wet. That’s what they’re for and they’ll save you around $70. Of course, I’ve somehow misplaced mine this summer. How could I lose a pair of shoes? 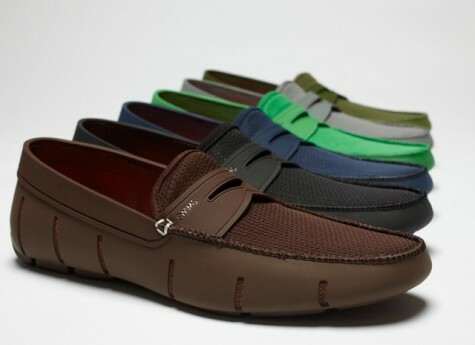 This entry was posted in Elegantology and tagged Mr. Porter, Sperry Top Sider, SWIMS loafers, Topsiders. Bookmark the permalink. Love these! Just showed them to my husband. Love the Penny loafer version best. What is expensive, compared to convenience? Enjoy your summer and wishing you a happy weekend. Score! Once again you have found the cool stuff, wow I can’t find my topsiders either, I guess I’ll have to find a replacement for them, hmmm I wonder where I can find something to replace them with? Good to have you back we don’t hear from you enough these days. “manmade materials” would those materials not make the shoes warm? Hello JG, you would think, but the uppers are mesh, although they don’t look it.